Leica has announced an Explorer Kit for its Leica V-Lux (Typ 114) compact travel camera. The kit includes the V-Lux itself with its 25-400mm range plus The Bowery for Leica camera bag from the ONA for Leica collection and a red Leica Rope Strap designed by COOPH. Leica V-Lux Explorer Kit. High end bag and distinctive red strap. The ONA bag's smartly-designed features and adjustable compartments are a helpful complement to the Leica V-Lux camera. And the rope strap, made from the same material used for climbing ropes, is both a robust and elegant carrying strap. The V-Lux Explorer Kit is available now for $1,350 from Adorama and B&H. Leica Camera has announced the release of the Leica V-Lux Explorer Kit. The new kit includes the Leica V-Lux (Typ 114), a universal compact camera ideal for travel, wildlife and fast-action photography and two premium accessories to create a stunning compilation that will have any photographer capturing picture-perfect memories in style. The high-end accessories in the set are a nod to the robust versatility of the Leica V-Lux and include The Bowery for Leica camera bag from the exclusive "ONA for Leica" collection and a red Leica Rope Strap designed by COOPH. The handcrafted camera bag is distinguished by its style and functionality. With its cleverly designed features and adjustable inner compartments, it offers optimum protection and ample space for the safe transportation of the Leica V-Lux camera and personal items. The rope strap is a simultaneously robust and elegant carrying strap that ensures safe and comfortable carrying of the camera in every situation. The strap is made from the same material used for climbing ropes and features elements in Italian leather for a stylish touch. 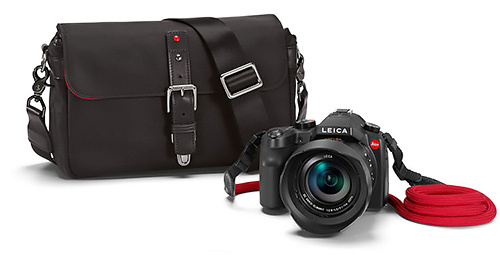 The two accessories are the perfect accompaniments to the Leica V-Lux, a camera that shines with the ability to capture a wide variety of photos on vacation, at sporting events or on an outdoor adventure. With an enormous range of focal lengths from 25 to 400mm, its zoom lens is ideal for capturing memories in picture perfect quality, including wide-angle, standard and super-telephoto photography, as well as macro close-ups down to a distance of only 1.18 in. Its fast autofocus reliably tracks every subject and a continuous shooting function with up to 12 frames per second at full resolution makes it the perfect choice for quickly moving subjects, from children to wildlife. The camera's performance profile also highlights a high-definition, 4K-resolution, digital video recording function that captures true-to-life memories in moving pictures.